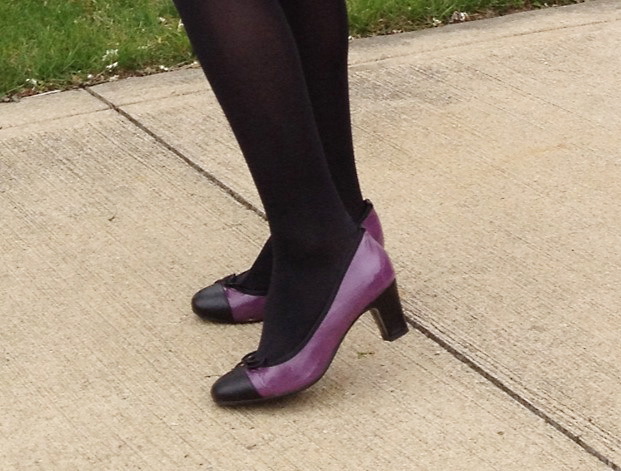 Welcome to FABBYLIFE: Pompili pumps: purple! You Are Here: Home - Deal , fashion , Our Lookbook , Pompili , Sinclair 10 , Theory , Zara - Pompili pumps: purple! My Pompili shoes, ordered from YOOX (mentioned in this entry), came yesterday! Size: runs slightly large, 1/4-1/2 size. I ordered my normal size, 6; they are slightly large on me, but still can handle them. Michelle normally wears 7.5, and she got this pair at size 7 (she has narrow feet). Color: Pretty purple with black cap and trim. Not very eye catchy, because you won't see a large piece of purple from top! Comfy level: I will give 5 star so far! Heel is about 2 inches, not 2.75'' as described. Shoes are light-weight. Quality: Leather upper and in sole. Heel is covered by black leather. The lining is fabric. Rubber sole. Made in Italy. Overall feeling: it is definitely worth $59! Now YOOX has free shipping for purchase >$200. My co-workers and I placed a group order yesterday..... I ordered another pair of flats from Pompili (crazy? I would get rid of all my Tory Burch flats. They are hurting my feet!). Here is the link for Pompili pumps. They are very comfortable indead. To me, wearing them just like wearing flat. I want to buy the red one too. which flat did you order? 1. nice color combination. low-key purple. 2. classic round toes. good proportion of black leather at front. 3. light weight and works for my skinny and narrow feet which can barely wear a normal pump. That would be perfect if the heels could be lowered to 1-1.5 inches. So I give 4.8/5.0.